Fresh Meat Productions | Win TIX to Sean Dorsey Dance’s 15th Anniversary Home Season! Win TIX to Sean Dorsey Dance’s 15th Anniversary Home Season! Win VIP tix to Sean Dorsey Dance 15th Anniversary Home Season in San Francisco plus a limited edition 15th Anniversary Sean Dorsey Dance T-Shirt! 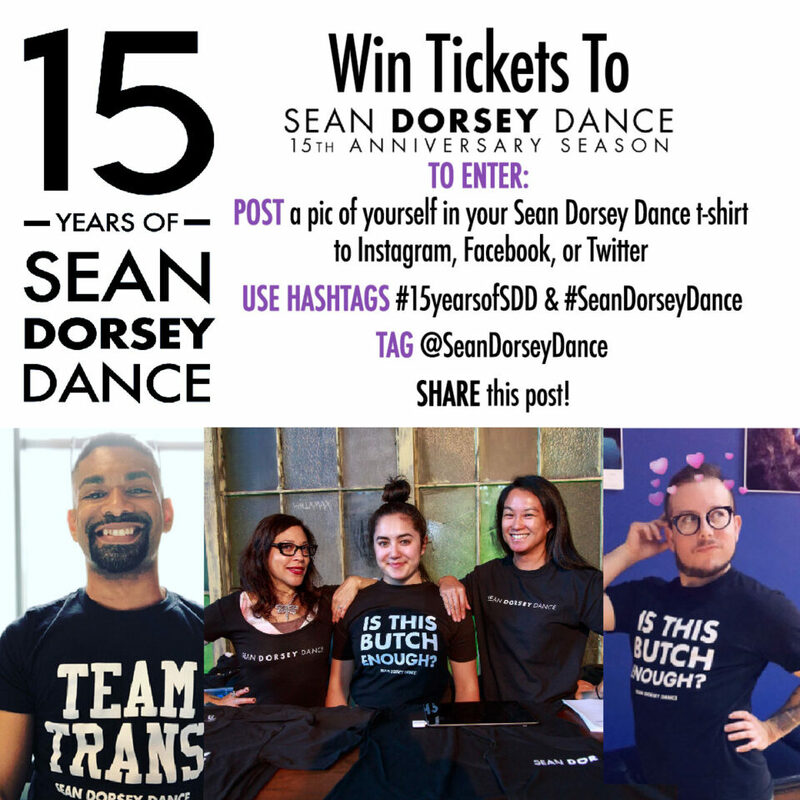 To be entered into the drawing, take a pic of yourself in a Sean Dorsey Dance t-shirt (could be “Sean Dorsey Dance” “Is This Butch Enough” or “Team Trans”) and post it to Instagram, Twitter, or Facebook (public posts only please). To be eligible use both hashtags: #15yearsofSDD and #SeanDorseyDance. Be sure to tag @SeanDorseyDance to make sure we see it and you will be entered to win. You will be entered for each site you post to, so it is possible to be entered 3 times if you post to Twitter, Facebook, and Instagram. We can’t wait to see your gorgeous pics!